What started as an amazing and wonderful archaeological event, against all odds, has now turned into a nasty, petty, childish, unnecessary war of insult trading, unbecoming of the memory of the medieval monarch it is supposed to support. Everything should have been so simple. Search begins, remains are found and identified, tests are run, remains are reinterred in close proximity to where they are found (according to good archaeological practice and the exhumation licence issued by the MoJ), country celebrates accordingly, King Richard III is left to rest in peace. End of. But no, everything kicked off with the emergence of 'The Plantagenet Alliance' and the ridiculous name calling of the good city of Leicester and its Cathedral by a small, historically uneducated minority, trying to have the remains reinterred in York Minster for the most tenuous of reasons. It is clear that the majority of the good people of York (and I have relatives there myself) really have no interest in the subject. However, they end up getting tarred by same brush as the 'Bring Him Home' crowd, even though York Minster itself have stated that they support the decision to reinter in Leicester Cathedral! Now, they have managed to have a fellow blogger suspended from Twitter for attempting to express his opinion and dispel the rumours of historical fiction circulated by some York supporters as fact. How ironic that they can descend to such nasty and unjustified defamation of character, but then appear astounded and appalled when someone dares to try and counter their opinions! There is an outcry about a critical personal opinion of one of their supporters. However, there is no mention of the derogatory name calling and criticism of the Cathedral following the public announcement of the plans for the new tomb design! Not to mention some of the appalling insults directed at the city of Leicester in general by people who have probably never even been there. Like the title of this post says...people in glass houses shouldn't throw stones. Personally I wanted this blog to be about the exciting developments in Leicester surrounding the excavations and the proceedings leading up to the reinterment ceremony in the Cathedral. 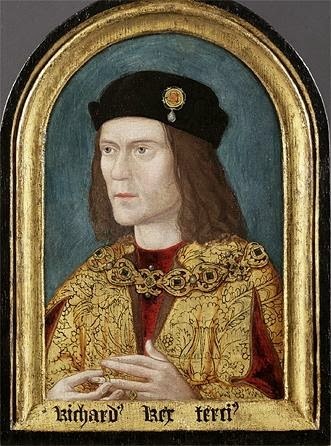 But it would appear that events surrounding this wonderful, historical event have become steeped in controversy synonymous with King Richard III himself! It would be fair to say that I am still convinced that justice will prevail and the outcome will be the right one. But how sad it is that this whole unnecessary performance will have held up the reburial by several months by the time it is sorted out. More time in which poor King Richard has to suffer the indignity of being kept in 'storage' while people argue about what his wishes may or may not have been over 500 years ago. Surely from a religious, ethical and basic personal dignity point of view, that should have been the first priority. Anyway, I hope that the situation is sorted out quickly and King Richard is reinterred in his new tomb in Leicester Cathedral as soon as possible. Then, hopefully, the people of both York and Leicester, as Richard himself, can rest in peace. Rant over. Thank you for reading. Sorry I got a bit serious, I am not confrontational by nature and will mostly do anything to stay out of an argument! But I am seriously dismayed that this wonderful historical, archaeological find of the century has been tainted by this whole petty and disrespectful situation which could, and really should have, been avoided. And if you haven't already done so, please show your support for Leicester by signing the petition. Serpie. This is brilliant. You have such a way with words!!! Thank you Shakey. I do not profess to being a great photographer, but I do enjoy taking photographs when I am out and about.